TS Model School 6th Hall tickets 2019 | TSMS 6th Class Admission Test Hall tickets at telanganams.cgg.gov.in. 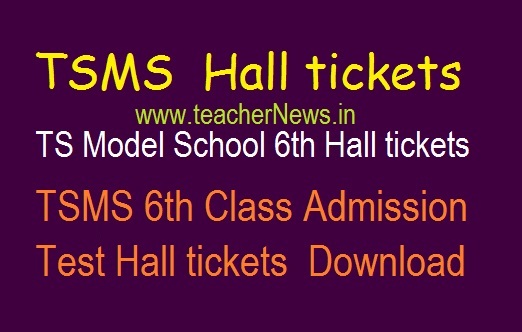 TSMS Hall tickets 2019 download for TS Model School 6th Class Admission 2019. Download 5th Class to 6th Class and Inter Entrance TS Model School 6th Hall tickets at telanganams.cgg.gov.in. TSMS CET Admit Card / Telangana Model Schools Admit Card, Telangana Model Schools Entrance test 2019. TS Model School 6th Hall tickets 2019 download @ telanganams.cgg.gov.in. Telangana Model Schools 6th Class admissions test Hall tickets for TS Model School Entrance Test 2019. Telangana Model Schools 6th Class Entrance Test 2019 Hall tickets, Telangana Model Schools VI Class Admission Test 2019. The Commissioner of School Education, Govt of Telangana released TS Model School Hall tickets 2019 for the Admission Test. The Commissioner and School Education Department officials issued the TS Model School Hall ticket for 6th Class Entrance Test 2019 TSMS CET 2019 Notification in the month of January 2019 for admission into VI class in Telangana Model Schools for the academic year 2019-2020. TSMS 7th/8th/9th/10th Classes Admission Test 2019 Hall tickets, Admit Card, selection list, Selected Candidates list for admission into TS Model schools 2019-2020. TS Model schools 6th, 7th, 8th, 9th, 10th classes Entrance test 2019. For any issues please contact to TSMS Help Line Numbers : Ph:040 23120335, 040 23120336 (Call Time : 10.30 AM to 1.00 PM & 1.30 PM to 5.00 PM on all working days). TS Model School Hall tickets 2019, TSMS 6th, 7th, 8th, 9th Class Admission Test Admit Card download @ telanganams.cgg.gov.in. TS Model School Admission Test Hall tickets 2019.